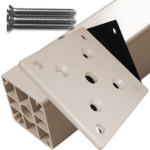 Below are aluminum post assembly bundles that combine our post options with the necessary compatible pieces and hardware for easier ordering. Scroll down further for a-la-cart posts and post pieces. How tall do you want your system to be (36” or 42”)? 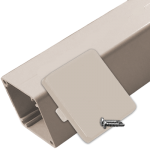 Do you want the posts on the top (Deck Mount) or the side (Fascia Mount) of your surface? Would you like your end fittings pre-swaged upon arrival using our Professional Swaging Service? 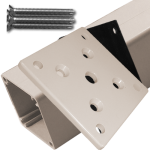 If so, then all the posts in your run need to be TERMINAL POSTS so the fittings can pass through. If you plan to hand-swage, you’ll need a Terminal Post at every start and stop point in your run. The posts between your terminals will be Intermediate Posts, guiding the cable, but not baring the force of the tension. Figure out how many terminal and intermediate posts you need based on this information. Give us a call if you have any questions. 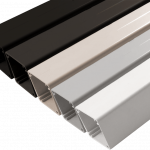 Note that Aluminum Comes in 5 Different Colors! This goes for all aluminum products. Aluminum posts are a classic railing option, as they are lighter and less expensive than other metals. 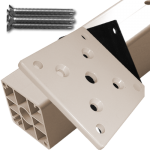 Most often, however, aluminum posts are made thin, and for cable railing systems, where the posts are not only supporting the top rail but withstanding the tension of taunt stainless steel cable, this is not ideal. 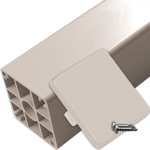 To resist bending and warping, our aluminum posts are made with a unique inner-webbing design and thicker walls.